The condition of precariousness not only provides insights into a segment of the world of work or of a particular subject group, but is also a standpoint for an overview of the condition of the social on a global scale. Because precariousness is multidimensional and polysemantic, it traverses contemporary society and multiple contexts, from industrial to class, gender, family relations as well as political participation, citizenship and migration. 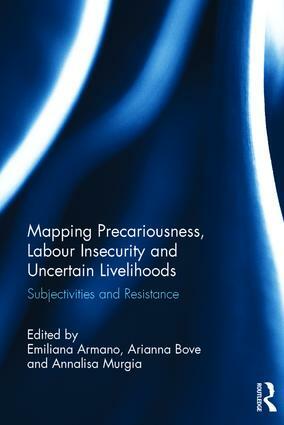 This book maps the differences and similarities in the ways precariousness and insecurity in employment and beyond unfold and are subjectively experienced in regions and sectors that are confronted with different labour histories, legislations and economic priorities. Establishing a constructive dialogue amongst different global regions and across disciplines, the chapters explore the shift from precariousness to precariat and collective subjects as it is being articulated in the current global crisis. This edited collection aims to continue a process of mapping experiences by means of ethnographies, fieldwork, interviews, content analysis, where the precarious define their condition and explain how they try to withdraw from, cope with or embrace it. This is valuable reading for students and academics interested in geography, sociology, economics and labour studies. "It is against such expansive theoretical terrain that Armano, Bove and Murgia’s edited volume sets out to trace the contours and expand on current conceptualisations. Suitably subtitled Subjectivities and Resistance: An Introduction, the volume considers the structural context of precarious work, yet goes beyond and engages with the grainy, casual and colloquial body of precarious narratives that emerge from the grass-roots and are in danger of being overlooked. The book is divided into three parts, investigating the precarious experience on three different levels and from three different standpoints." "Angela Mitropoulos’s final, summary chapter is particularly noteworthy as it connects the precarity of labour market structures with the precariousness of existence in a mosaic of markets, state policy, labour valorisation and regulative order. It restates the continued scope for individual resistance in the face of precarious odds, reminding that the volume is equally concerned with past trends, and the direction of future travel." 4. The French Business and Employment Co-operative: An Autonomy Factory? 14. Working for Nothing. The Latest High-Growth Sector? Emiliana Armano has a PhD in Labour Studies at the Department of Social and Political Sciences in the State University of Milan, Italy. Arianna Bove is a Lecturer in Politics and Ethics at the School of Business and Management, Queen Mary, University of London, UK. Annalisa Murgia is Associate Professor in Human Resources Management, Leeds University Business School, UK.